Eddie Redmayne sends ANOTHER note, this time on his Golden Globe Nomination! Johann is the composer of the beautiful score. And Felicity of course, is his co-star who plays his brave wife Jane Hawking, on whose book the film is based. Who also happily got a double nomination from both SAG and the Golden Globes and well as the film being cited by both organizations. have added to the chorus of raves for the just screened “Selma” at the AFI fest in Hollywood. That must have really been an incredibly exciting screening to have been at last night! 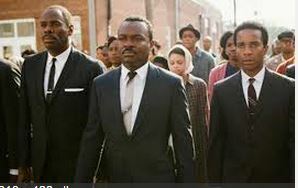 It ended with a standing ovation, and has propelled “Selma” in the fray of the Best Picture race. And star David Oyelowo as Martin Luther King himself into that much contended about fifth slot in the too-crowded Best Actor race. The other male stars who are already seriously “locked” are Eddie Redmayne for “The Theory of Everything”, Benedict Cumberbatch for “Imitation Game”, Michael Keaton for “Birdman” and supposedly Steve Carrel for “Foxcatcher”. But HOLT ON for a moment! I really am getting Tom Hanks in “Captain Phillips” vibes from Carrell’s supposedly certain position. Remember last year when the beloved Hanks in an acclaimed performance came up short? And didn’t even get nominated? And debut actor Barkhad Abdi did? Could happen again. But it sure looks like Oyelowo is going to crash the gate at the last-minute! GOOD! FINALLY a person of color is seriously contending after last year’s “12 Years a Slave” supposedly blew off the Oscar doors. But the question is if “Selma” is nominated and it certainly looks like it will be, will the conservative Academy want to give TWO pictures about racism the Best Picture award TWO years in a row? In her history making Oscar acceptance speech when she won Best Supporting Actress for “12 Years a Slave” last night, Lupita Nyong’o thanked “the Wilsons” her “adopted family” which is the nick name the Yale School of Drama Class of 2012 called themselves, and here’s my interview with one of them, William DeMerritt. Shot last May 2013 at the Drama Desk Reception, William talks about his class. And let me tell you, they are all just as talented as Lupita! And I’ll mention a few of them by name, Michael Place, Seamus Mulcahy and Fisher Neal among many others. Michael Place helped hook me up with William for this great shoot at the Essex House last May. He was helping me along with my former co-host T.J.Craig, who were helping be my “Celebrity Pullers” or the distinguished gentlemen who were helping bring the newly named Drama Desk nominees over to be interviewed by me that May morning. Enjoy! Notice that William names Lupita first when he starts listing other classmates that I didn’t mention. Oscar Change of Heart for Feinberg! Everybody loves Lupita! Bascially, he’s changing his print edition pick of Jennifer Lawrence for Best Supporting Actress to my fave Lupita Nyong’O. I’ve seen this coming all along and it’s simply based on the excellence of her heart-wrenching performance. For those too busy to read Scott’s excellent article, I’ll try to explain it quickly. He has come to the conclusion that “12 Years a Slave” is going to win Best Picture, but he rightly posits, “What else?” Not since the 1930’s has an Oscar winning movie only won the main award and nothing else. So Lupita is someone the world has fallen in love with this year EVEN IF THEY HAVEN’T WATCHED THE MOVIE!?!?! And tragedy ALWAYS trumps comedy(J-Law in the light-weight throw away “American Hustle”) and JLaw has not been anywhere this Oscar season to campaign for her second Oscar. Already having won last year for “Silver Linings Playbook”, it’s truly too much too soon. Two Oscars In a Row could kill her. If you saw her acceptance speech when she won at the Golden Globes, Jennifer looked like she was going to have a nervous breakdown And said “Stop doing this to me!” which means giving her allll these awards. She’s only 23. And to give her two Oscars before she was even 24 Scott Feinberg(and Anne Thompson AND Mark Harris AND Sasha Stone AND Jeff Wells, btw) all think it’s not going happen. Scott also notes that he had to put his Oscar article to bed(or file it) BEFORE the VOTING was even closed. I can identify. Because for 25 years that’s what I had to do with my TV show vis a vis getting it edited and on the air in time for the Oscar date. But this year I didn’t. For the first time since forever(to paraphrase “Frozen”) I did not shoot an Academy Awards prediction show. And really the race has been SOOOOO volatile this year that it actually was suited more to the Internet and this blog, which I can do anytime and all day long, 24/7, and so yes, I’m perfectly fine with Scott’s assumptions. JLaw is shooting ANOTHER “Hunger Games” so as Scott said it’s “an excused absence” but Lupita has been every where charming everyone and becoming a Fashion Icon as well as an instant Pop Culture heroine. So I’m very happy to share Scott’s great article. The only limb I seem to be going out on here is Chiwetel. But he gave the Best Performance, IMHO, and he’s an actors actor. And while Matthew Mc. is wowing everyone on HBO. It’s TV!!!! It makes him a television actor,T a Hwood star but not yet a film ACTOR. Yes, the Academy is old enough to still make that snobbish disctinction between the media(s) and yes, they still look down their noses at television, which they STILL see as “the enemy.” Like they did, well, in the ’50s. AND IT’S STILL THE SAME PEOPLE VOTING! It’s the “slap the stud syndrome” as Tom O’Neil at http://www.golddergy.com And the SWORM want to make MMcC suffer just a little bit more for all those godawful romcoms he did for years. I’ve never posted so many blog posts as I have this year, but there’s been soooo much to say, and soooo many good films to write about. And now, the Envelope PLEASE!!!! The United Colors of Lupita! A picture, in this case a photoshopped one, is STILL worth a thousand words! And all of them are Lupita, Lupita, Lupita!!! Scott Feinberg has chosen to wind up his extensive coverage of The Race over at the Hollywood Reporter http://www.thehollywoodreporter.com with anonymous, and VERY candid interviews with FOUR very differnet Academy voting members. They are all so all over the place, it’s not to be believed. 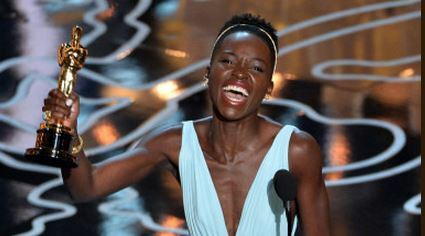 This year is one for the record books in that sense, but three out of the four VERY different(men I think, all of them, so far) all agreed on only one thing LUPITA NYONG’O for Best Supporting Actress!!! And none of these voters were from the Actor’s Branch which already awarded her the SAG award in this category. And the excellent Mark Harris notes that if “12 Years a Slave” loses to “Gravity”(or something else), it will win what “Precious” won which was Best Adapted Screenplay and Best Supporting Actress. E.T.A. They also all agreed on Cate Blanchett.